This simple design is a popular favorite! 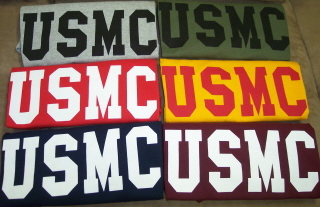 Available in sport gray long or short sleeve, military green with black ink or pink ink, navy blue, red, gold or maroon. This heavy preshrunk cotton t-shirt is printed on both sides with the Eagle, Globe and Anchor on the back side of the shirt. The gray short sleeve, military green, navy blue and red t-shirts are available in sizes small - 4XL. The gray long sleeve, gold, and maroon t-shirts are available in sizes small - 3XL. Tank top is available in gray, navy blue and red in sizes small - 2XL. Long sleeve t-shirts $18.00.